To do something others can only dream of? To help people transform their lives? To open doors you didn’t even know existed? The Open Water Scuba Instructor (OWSI) program is one of two distinct components of PADI’s Instructor Development Course (IDC), held here in Tenerife. The first portion is the PADI Assistant Instructor course followed by the Open Water Scuba Instructor program. It introduces you to the entire PADI System of diver education and concentrates on further developing your abilities as a professional dive educator. You’ll also have the opportunity to continue your professional education by participating in specialty instructor courses, which train you to teach specialties after instructor certification. The challenging part of this course is your personal commitment to the training. The course requires you to complete all the self-study Knowledge Reviews before the course begins and to prepare daily assignments for teaching presentations. Organization and dedication are key. You will demonstrate competence at performing all 20 dive skills listed on the Skill Evaluation. performing a facedown, nonstop swim for 800 metres/yards using a mask, snorkel and fins. 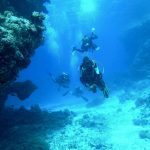 You will be able to conduct the entire range of PADI programs from Discover Scuba Diving up to Divemaster. The PADI IDC includes all the materials needed to prepare for a PADI Assistant Instructor or Open Water Scuba Instructor course. Specialty outlines for Project AWARE PADI Instructor Manual. The PADI Instructor courses (IDC) will now all take place at our PADI 5 Star IDC Centre in Abades.